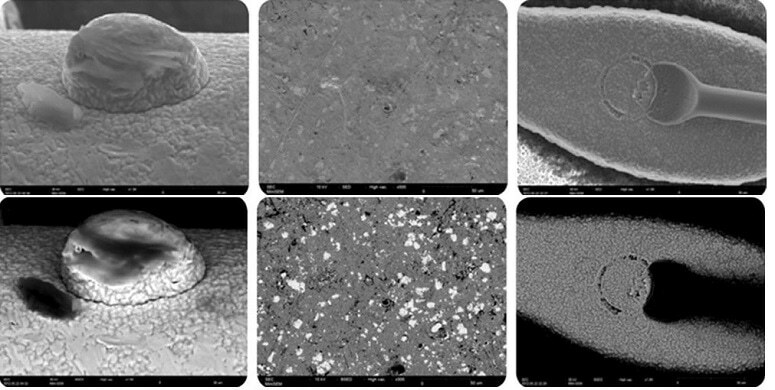 Tabletop Scanning Electron Microscopes are becoming more widely accepted. Unfortunately, many of them are overly simplified. In contrast, SEC’s SNE-4500M is a “real” SEM ... a scanning electron microscope platform that gives you broader choices for accelerating voltages, detectors, spot size, variable apertures, vacuum systems, and image analysis .. all designed to best fit your application and your budget. At the same time, it is compact, robust, and easy to use and maintain. As you can see in this short video, SNE-4500 has an intuitive interface that requires minimal training. Set accelerating voltage, detector, and vacuum at the click of a button. Adjust stage position, rotation, and tilt with the gentle slide of a bar. For quick set-up, there is auto start, auto focus, auto stigmator adjustment, and auto contrast and brightness control. What is important for YOUR application? Figure 1. What is important for your application? Is YOUR application in our gallery? 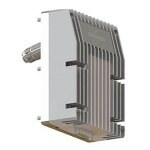 With resolutions down to 5 nm and accelerating voltages from 1 to 30 KeV, SNE-4500’s platform is flexible enough to address a wide range of applications, as demonstrated by the variety of samples in Figure 1. 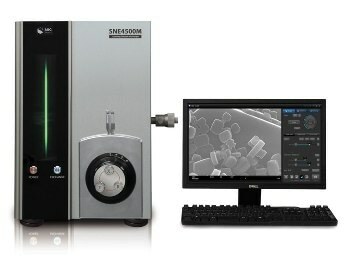 The SNE-4500M is at home in the routine labs of materials analysis, pharma, and geology; the rugged production environments of automotive, aerospace, semiconductors and electronics; and the rigorous, demanding arenas of research in nanotech and the life sciences. Its mix of strong fundamentals and effortless response also makes it a great system for education. As demonstrated in Figure 2, SNE-4500M’s standard secondary electron detector readily captures surface and topographical details. 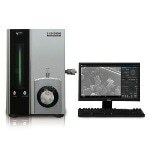 For elemental contrast and imaging material interfaces, the optional back scattered electron detector is invaluable. To optimize the information gathered from each imaging modality, the software provides both side-by-side comparisons of the two or composite images. EDS spectra can be acquired in either imaging mode. For standard high vacuum mode, the SNE-4500M comes fitted with a Pfeiffer HiPace Turbo Molecular Pump. High vacuum mode can be combined with low beam energy (ex: 1kV) to provide beautiful, scientifically relevant images of specimens like non-coated biological samples. To reduce charging on non-conductive samples, the system can also be ordered with an optional low vacuum mode. 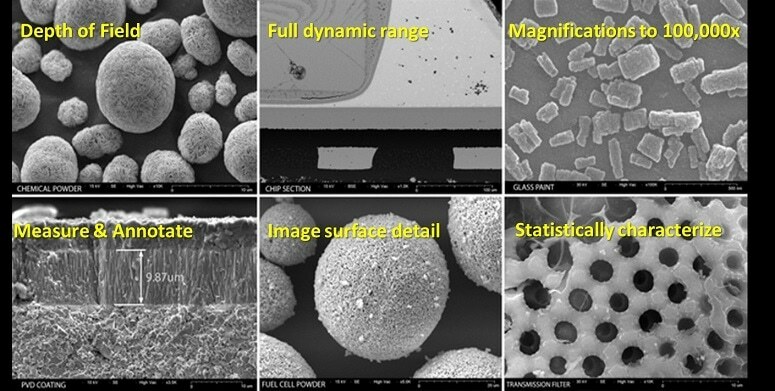 EDS turns the SEM into a power analytical tool (Figure 3), allowing the user to probe the elemental composition of almost any sample and precisely determine elemental concentrations from Boron to Californium. Measurements can be made in area maps, multiple points, polygons, circles and linescan mode. 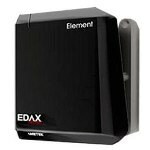 The SNE-4500M readily accepts either the Bruker Xflash 630 EDS or the EDAX Element EDS. EDS systems from other suppliers will also be available soon. 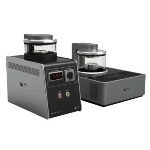 The SNE-4500’s comfortable sample chamber can accommodate samples up to 80mm in diameter (XY) and 35mm in height (Z). Unlike other conventional desktop SEMs, this SEC model comes with a standard 5-Axis Stage, allowing you to move your sample by ±40mm in XY, 35mm in Z, or rotate it through a full 360°. To improve perspective for surface structure as well to maximize collection of characteristic x-rays for EDS, it also tilts from 0° to 45°. In addition, the beam can be shifted +/- 150mm to center features of interest without moving the stage, a capability that is especially important when working at high magnifications. As discussed above, the SNE-4500M’s interface and automatic controls make it easy to run, even for a student or someone new to electron microscopy. The same ease has been engineered into routine maintenance. For example, a pre-centered Tungsten Filament Cartridge makes filament exchange a snap and indicator lights on circuit boards help trouble shoot if an electronic problem arises. An image is only as good as the data is produces. As shown in the video, simple measurement such as 2-point or multi-point lengths and angle, diameter, and area are integral to SNE-4500M’s software, as are the ability to annotate with arrows, rectangles and text. 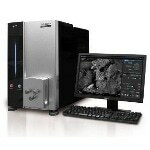 For more advanced capabilities such as particle sizing, porosity, or fiber analyses, the system readily integrates with the MIPAR Image Analysis software. Need to publish or communicate with colleagues? Images from all SEC microscopes can readily be exported in JPEG, TIFF, BMP, and PNG, not some hard-to-transfer proprietary file structure. For the best balance between storage and optimum publishing quality, images can be captured in a range of pixel densities from 320x240 pixels up to high definition 5120x3840 pixels. .